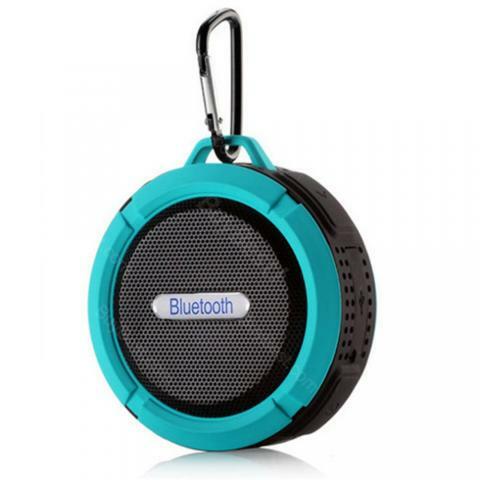 The C6 Bluetooth Speaker with Big Sucker is waterproof, shockproof and dustproof. Perfect for outdoor activity. • Outdoor portable waterproof, mountaineering buckle configuration. • You can enjoy the fun of walking on the package at any time and place. • Overweight subwoofer design, voice loud and clear, perfect sound. • Waterproof aluminum sealed speaker, and it's 5W speaker, so give you much better quality stereo experience. • After 15 minutes without any operation since you powered on, the product will shut down automatically. • The silicone cases and interface design ensure good sealing, effectively prevent the rain and dust, can be used under harsh environment). • Waterproof, Shockproof, dustproof, level up to IP56. • Supports all Bluetooth phone connection. • Boot automatically into the Bluetooth state, within 10 meters within the accessible range to provide high-quality stereo audio signal transmission. • 15 minutes intelligent shutdown. • Powerful polymer A product power 80% of the volume of continuous playback for 3.5 hours or more. • Quick link：Cartoon Bluetooth Speaker Dabai. Very loud speaker for its size. Match the description. Arrived in less than two weeks. Column child very satisfied. Thank You for the efficient work. Complete charging cord, box. Packed very well. This thing is awesome. It sounds so good. This is my first device in the echo series and I really like that fact that I can use the app to equalize the sound. 무엇보다도 복잡하기 짝이 없던 기존 스피커의 전선들이 사라져서 참 좋습니다. 가성비 훌륭하다고 할 수 있습니다. 품질도 마감도 만족스럽네요. 취향좀 탈듯하네요. Working at a distance of more than 20 meters, and stated to 10 m. Sound in the middle and low power more or less. Sound quality is the best I've heard on a speaker of this size!!! Definitely worth paying a little extra for this one over the 2nd generation model. I'm not going to discuss the functionality as there's tons of info already out there. 어머님 드렸는데 상당히 만족 하시네여 ㅎㅎ 생각보다 무게가 있네요 !!! 작고 소리도 크고 좋습니다~!